The danger of sea travel and the mysteries of the ocean have produced some elaborate and fascinating mythology over the thousands of years humans have been at sea. At the whims of weather and water, the rough and adventurous lives of sailors and seafarers led to the creation of a wide variety of superstitions, omens and rituals. Gods had to be supplicated, mermaids avoided and traditional rites observed in order to maintain a safe and productive journey. Perhaps the most enduring of these rituals is the Crossing the Line Ceremony. An initiation rite, this ceremony required all members of a ship’s company who had not previously crossed the equator to participate in a special ritual to mark the occasion. Upon the conclusion of the ceremony, sailors were admitted to the hallowed company of their more experienced colleagues and were, from then on, granted protection from the sea and its dangers. Having become one of our loyal subjects we recommend all sharks, dolphins, whales, eels etc., under our command to abstain from eating, playing with or otherwise maltreating him. The ceremony itself consists of a cast of mythical characters played members of a ship’s company. In a pantomime-like setting, the characters include King Neptune, crowned and with a long flowing beard, his wife Queen Amphitrite, an evil barber, a villainous surgeon and some fierce guards. The attendance of numerous nymphs and (rather oddly) bears, round out the King’s motley court. After being paraded around the ship, the inductee is then taken to a platform above a large bath that is filled with seawater. After receiving the attentions of both surgeon and barber, the subject is then tipped backwards into the bath where the bears ensure they are well and truly soaked. The procedure earns the inductee a certificate which exempts them from participating in any further Crossing the Line Ceremonies during future journeys. 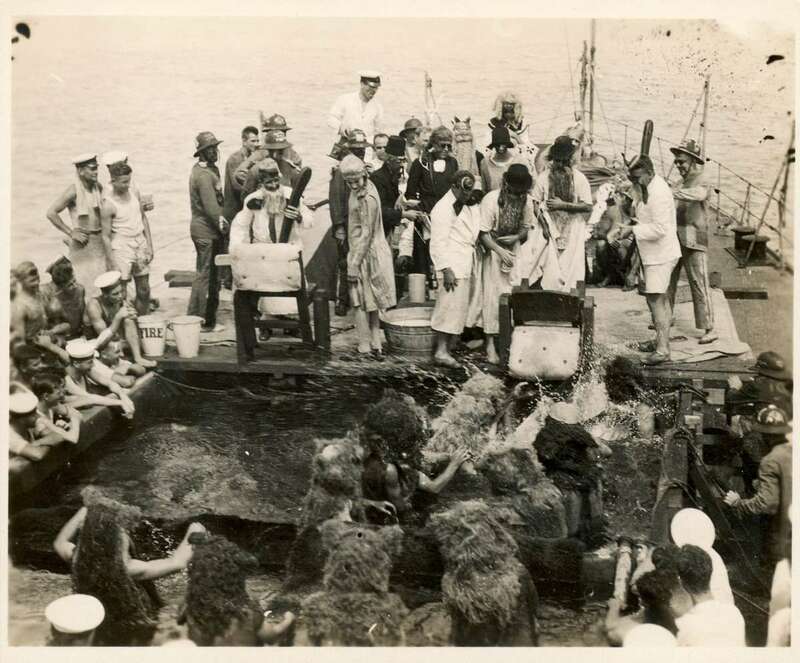 Crossing the Line Ceremony, probably onboard HMAS MELBOURNE c 1928, showing King Neptune, his court and bears dunking inductees. Documentary accounts of this ceremony appear from the early 18thcentury and suggest that it was originally a physical test designed to prove an inductee’s ability to endure the hardships of life at sea. The ceremony, in both altered and traditional states, is still practiced to this day in a wide variety of circumstances such as onboard merchant ships, commercial cruise liners or military vessels. 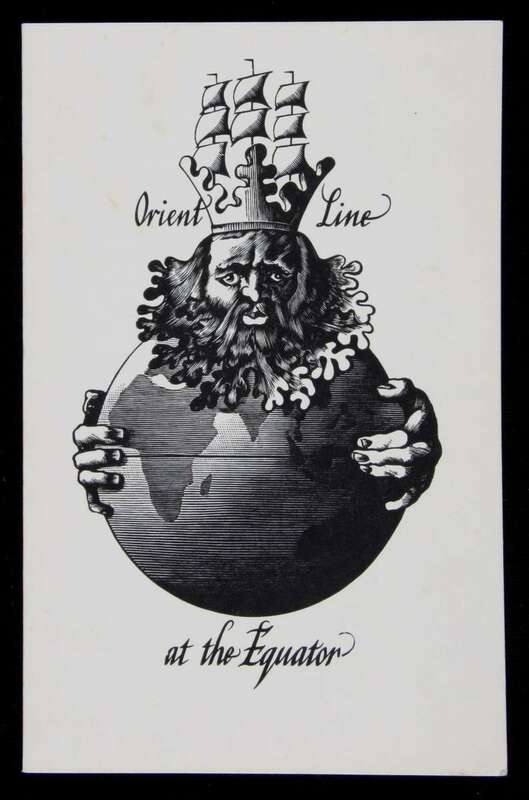 This diverse use of the ceremony, whether performed on a cruise holiday, an immigration vessel or by military personnel, is reflected in the ephemera collection of the Australian National Maritime Museum. Our most noble Cross of the Equator be bestowed on R A Smith who but a mere Mortal hath… accepted with Good Humour and Withstood with Fortitude the most Rigorous Initiation into the Ancient and Moistening Rights of our Aquatic Court. 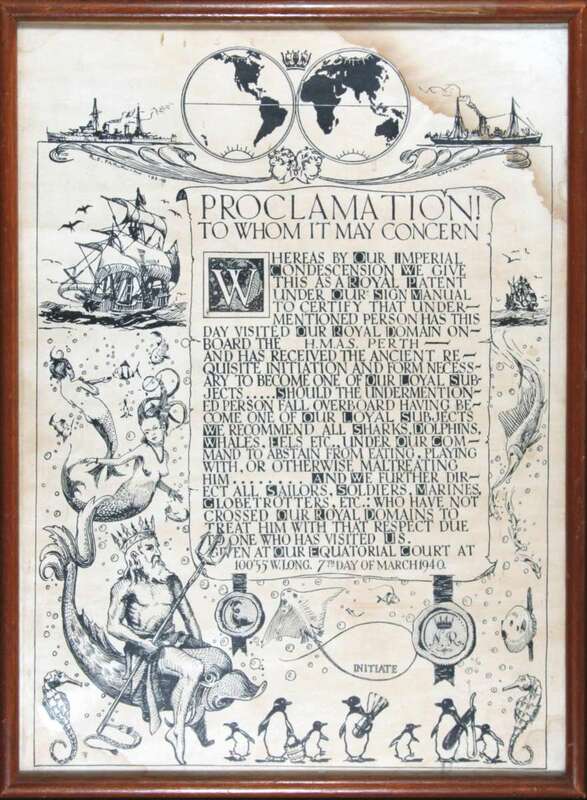 And finally, a certificate from HMAS Perth (seen below) and dated March 1940 proves that the occasion of the war would not impede the traditional observance of the Crossing the Line Ceremony on this vessel. Despite advances in technology and our understanding of weather patterns and the sea, the tradition of the Crossing the Line ceremony has proved remarkably popular. Perhaps now more of a comedic performance than superstitious ritual, Crossing the Line ceremonies remain an iconic component of sea travel.